I originally posted this article to a local Co-working group I’m a part of, but decided to share it here as well. I’ve edited it slightly here, but the point of the story holds true. A large part of Epic Duck Studios is Commissioned Painting. Over the years I’ve had differing levels of success – at one point I was painting full time and living with constant feast/famine syndrome. I’d get a project scope wrong, have a picky client, or just overestimate how quickly I could paint something, and suddenly I was working my backside off and making $8/hr because something I thought would take an hour took two and half. It doesn’t matter *what* you’re doing as a Freelancer, we’ve all done that once or twice. A few years ago, I decided to re-enter the workforce and put my business on hold, and I’ve really just been painting as a hobby since then. My intent was to develop my skill, and start painting at international competitive levels. To that end, I started getting REALLY focused on the small details, and suddenly models that used to take me 2 hours to paint were taking 6 or 8 or 17. Sure, they looked a LOT more detailed, but they also just weren’t getting done. In the first 6 months of this year, I managed to paint maybe 5 models. The Knight Titan in particular took almost 70 hours. After venting about this on Twitter, a fellow painter challenged me to a 2 hour paint-off. He had been in a similar rut before, getting bogged down on the tiny details, and this was how he broke out of it. 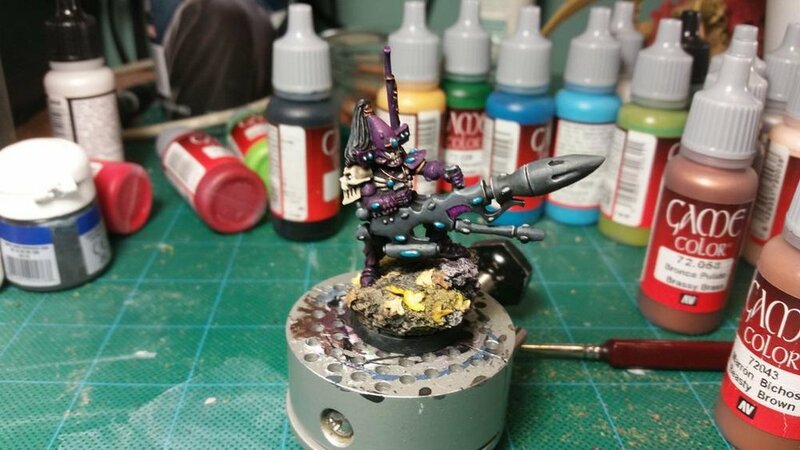 So I selected a miniature – the Eldar Dark Reaper Exarch below – sat down, and started a Stopwatch. I made quick gut-instinct colour and brush choices. I let myself make mistakes. I painted over tiny details and went back to attend to them later. I didn’t worry about the parts of the model that can’t easily be seen. The completed Dark Reaper Exarch at the 2 hour mark. At an hour and 5 minutes in, the model was effectively done – I took a short break to let a wash dry. In almost half my alloted time, the model was good enough that, had it been for a customer, I would have turned a profit. More than that, it was 1/8th of the time I take lately, and the project was effectively complete. I spent the last 40 minutes just adding the shiny spots on the gems, the sharp edges of the weapon, little things like that. I looked for mistakes at the very end, and quickly fixed them. When my time was up, I was elated; I hadn’t finished a miniature in 2 hours in what felt like years. TL;DR: It’s easy to get bogged down in the details and lose sight of what’s important; it’s easy to overstep your scope and let your inner perfectionist drive you to do too much work for too little pay. Sometimes you need to let the details go and focus on the bigger picture to get things done. And sometimes, you need a stopwatch. I’ve said before that Painting is my Zen Place. I didn’t actually expect it to teach me valuable life-lessons though.